The following excerpts illustrate the type of feedback that is provided in the report. The fragments are closely based on actual reports, although some of the details have been edited to protect the confidentiality of our customers. This report touches on the higher-level issues that cannot easily be addressed in the accompanying inline comments. While many of the comments concern aspects of the plot and characters that need further strengthening, I first want to stress that overall, I think the fundamentals of the story are very promising. I hope this report will support you in putting the finishing touches on what should be a great book. The second issue is that the timeline isn’t always easy to follow. For example, when it’s evening in Jess’s storyline, and it’s evening in James’s storyline in the next chapter, is this the same evening? In at least one case, the timeline doesn’t feel right – Jess reported that the ring had been sighted in Kensington several chapters before Chris offered to sell it to the antique dealer. A number of times the personal pronouns are ambiguous: he/him, they/them. I’ve indicated this when I noticed it. While you can often use personal pronouns, if there are two men in a sentence, make sure it’s clear who the “he” or “his” refers to. It can be unclear to the reader. The good news: you have some very good descriptions of nature. The chapters set in the mountains are very evocative, and the description of the gang entering the apartment is excellent. The fight with Grayson is wonderful too, with Chris stepping in to save the day. Some chapters and scenes read very fluently and require little editing for grammar, whereas others are “messy” with many repeated words and poorly structured sentences. Nothing that can’t be fixed, though! The author expressed concern that he had received reviews that stated the novel could be cut by a third. I disagree that this much needs to be cut from the novel, as it has a clear path and leads the reader to the conclusion in a well-thought-out manner and with good pacing, for the most part. However, I do believe some brevity in relating the archdeacon’s traits by other characters would serve the novel well and help to maintain the pacing set by the protagonist’s mounting discoveries. 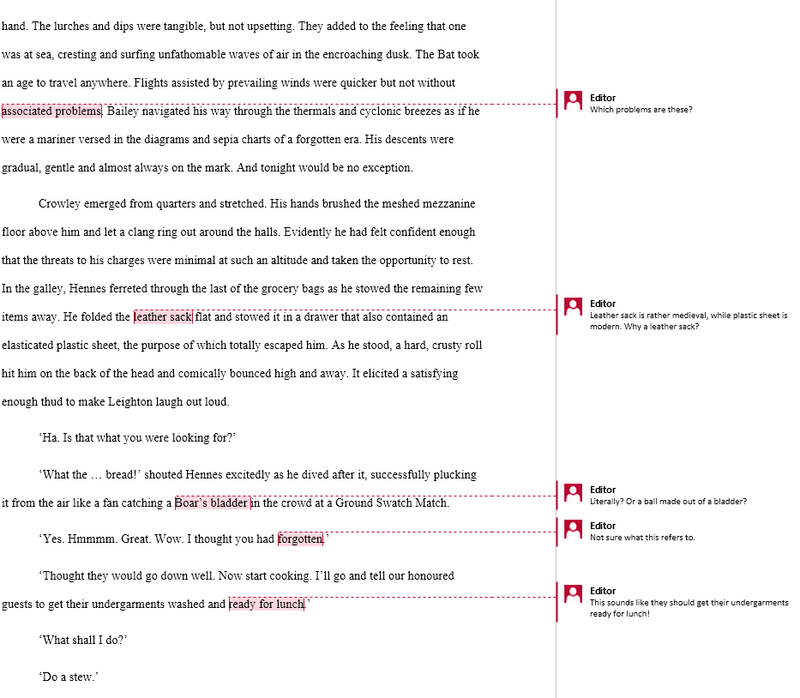 Also, the editing of the dialogue, as previously mentioned, would help to smooth out the pace. 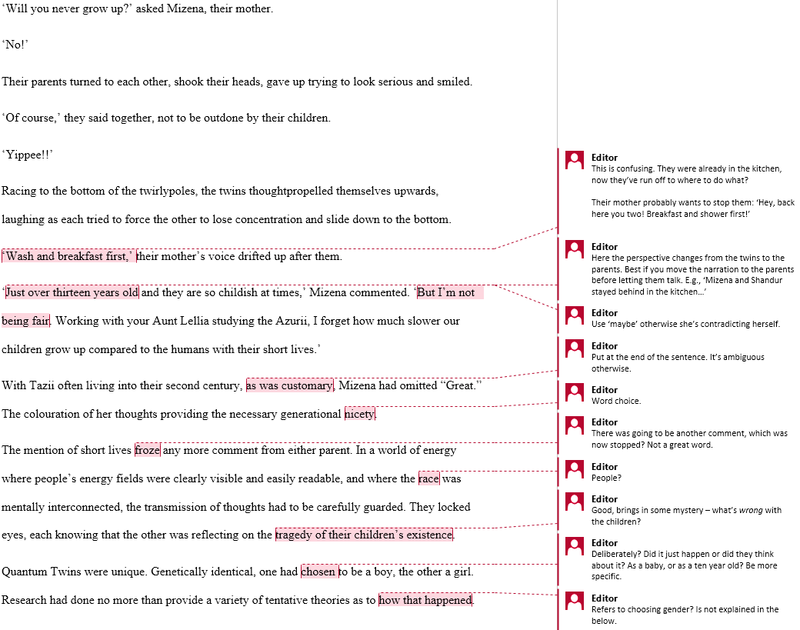 The following two examples illustrate how inline comments are used to help guide writers in producing an improved final draft.